Obesity and weight-related health issues have prompted the search for low calorie sweeteners for years. Several sweeteners, including saccharine, aspartame and sucralose have entered the market, and have quickly developed their own fan base. While these sweeteners have their own following, none of them are truthfully natural sweeteners. Now, one relative new entrant into the industry is beginning o give these sugar substitutes a stiff fight, and with reason. Stevia has been around for years, centuries in fact. It’s extracted from a shrub that is mostly found in Paraguay and Brazil. Down south, it’s been used not just as a sweetener, but also in traditional medicine in South America for the treatment of diabetes and reduction of blood pressure. The Food and Drug Administration (FDA) has only recently given its approval for rebaudioside A, the sweetest extract of the shrub. Though stevia is yet to get official approval in Europe, the Japanese have been using it for the last 30 years. So what does stevia have that the other sweeteners don’t? For starters, liquid stevia is 10 to 15 times sweeter than regular table sugar. 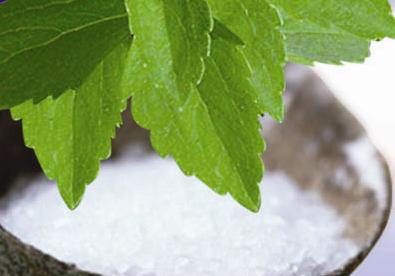 Stevia gets its sweetness from glycosides – a combination of glucose (a form of sugar) and stevia. In the stevia plant, Stevioside has the largest concentration of glycoside. Stevioside constitutes nearly 10 percent of the dried stevia plant, and is nearly 300 times as sweet as sugar. Stevia has also one distinct advantage over other sweeteners- it’s a true blue natural sweetener. So while others can claim of being sweeteners, stevia is a low calorie and natural sweetener, making it perfect for new age types, who want the zero calories without the chemicals. Various studies have been conducted to gauge the effect of stevioside, but the reports remain inconclusive. The studies have been conducted on animals and human beings. In animals, stevia passes through the body without any changes in its composition. Steviol is also believed to affect your diabetes and blood pressure. In one study on human beings, it was found that a group of diabetic patients showed remarkable reduction in their blood glucose levels after consuming foods containing stevioside when compared to the same foods prepared with starch. However, this benefit was nullified in another study when a control group was given stevioside-containing foods for three months, and compared with another group that took a placebo. There was no significant drop in the blood glucose levels nor in blood pressure levels. A separate study in China concluded that blood pressure levels dropped by 10 mm mercury after consumption of foods prepared with stevioside over a two year period. Tests for toxicity carried out in Japan have concluded that the extract has no toxic effects, although some people had intestinal discomfort after consuming stevia. These tests have concluded that stevioside is safe if the daily intake is restricted to 5mg – 1 gm per kilogram of body weight. Stevia passes through the human body without any changes in its composition, and so is considered safe. The composition also doesn’t change when cooked with heat. But stevia’s effect on diabetes and blood pressure is still inconclusive. If it has a small or insignificant effect on blood glucose levels, then it will have a wider market. Any adverse effect, like the effects of table sugar on blood sugar levels, would limit its popularity. We need more in depth studies taking in to consideration all diabetes-related factors including lifestyle habits to determine the effects of stevia. For the time being, stevia seems to be a healthy alternative to sugar. More studies are in progress in Europe. Acceptance by major companies such as Coke and Pepsi and others could promote stevia use worldwide.